In the world of mobile computing devices, there are three main categories. First you have smartphones, which are quickly replacing the second main category for younger users: laptops. But that makes the third category, tablets, even more important. Pricey notebook computers are no longer a necessity for many people, but small smartphone screens can be quite prohibitive in many instances. If you’re in the market for a new tablet to compliment your phone or to replace your dusty old laptop, we’ve got three great recommendations for you. 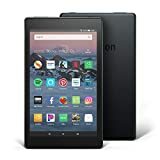 Even after all these years, the Amazon Fire 7 tablet’s shockingly affordable price tag still feels like a mistake whenever we see it. Amazon’s tablets deliver such a great experience and so much value, and they have access to all the apps you need for work and entertainment. The Fire 7 is no exception, packing all that and more into a compact 7-inch device that’s easy to take with you anywhere. Alexa is included as an added bonus, so you can ask it all the questions you want, order products from Amazon with your voice, or control all your smart home gadgets. Have you ever heard the phrase, “everything you can do, I can do better”? Well that’s exactly how the Amazon Fire HD 8 compares to the Fire 7 tablet. It offers the same great software and all the features from its smaller sibling, but there are a bunch of bonuses you get for a modest price increase. For one thing, you get a larger display with stunning 1280 x 800 resolution. You also get more RAM, 10 hours of battery life, and hands-free Alexa so you don’t even have to touch your tablet when you give Alexa commands! It should go without saying at this point that if you want the best possible experience from a tablet and you’re willing to pay a premium, Apple’s iPad lineup is as good as it gets. And of course it should also go without saying that the just-released iPad Pro models give users the best iPad experience Apple has ever offered. The new design is stunning, the Retina display and narrow bezels are gorgeous, and the A12X Bionic chip delivers more power than you’ll get out of even some of the most powerful laptops on the market. 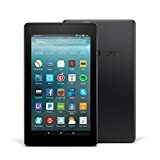 Fire HD 10 Tablet. Amazon’s Fire HD 10 tablet is just like the Fire HD 8, but it has a larger display that’s perfect for watching movies. It also has hands-free Alexa voice control, so it doubles as an Echo, too! Apple iPad Pro (12.9-inch). If you’re looking for a high-end tablet with the largest possible display and the most power available, the new 12.9-inch iPad Pro is the only way to go. Apple iPad. You don’t need to spend an arm and a leg on an iPad Pro to get a terrific iOS tablet, and Apple’s latest entry-level iPad is a great reminder of that. Samsung Galaxy Tab A 10.1″. Amazon’s Fire tablets are the best Android tablets in the business, but Samsung makes some sweet tablets too, and the newest Galaxy Tab A is a great option. Microsoft Surface Pro. If you’re looking for a tablet form factor that’s actually a full-blown Windows PC, the 5th-generation Microsoft Surface Pro is the best option out there.